A sunset show with Sunn O))) in the intimate setting of a historic 1914 library. Please take note that Sunn O))) will hit the stage at 9:00pm sharp. Anyways. The guys ended up on the cover of Arthur No. 20 (below) and now they’re international weirdstars. Go figure. Actually, go see them. Actually, go feel them in Eagle Rock next week. We will be. 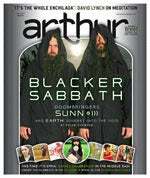 Arthur freaks may remember Brian Evenson from his cover feature on Sunn 0))) and Earth, published in Arthur No. 20, and his short bit on an imaginary disease in Arthur No. 7. Following is the opening story from Brian’s newest collection of short fiction, Fugue State, published by Coffeehouse Press and available now from Powell’s, Amazon and the best bookstore near you. Years later, she was still calling her sister, trying to understand what exactly had happened. It still made no sense to her, but her sister, older, couldn’t help. Her sister had completely forgotten—or would have if the younger sister wasn’t always reminding her. The younger sister imagined, each time she talked to her sibling on the telephone, each time she brought the incident up, her older sister pressing her palm against her forehead as she waited for her to say what she had to say, so that she, the older sister, the only one of the sisters with a family of her own, could politely sidestep her inquiries and go back to living her life. Her older sister had always managed to do that, to nimbly sidestep anything that came her way so as to simply go on with her life. For years, the younger sister had envied this, watching from farther and farther behind as her older sister sashayed past those events that an instant later struck the younger sister head-on and almost destroyed her. The younger sister was always being almost destroyed by events, and then had to spend months desperately piecing herself together enough so that when once again she was struck head-on, she would only be almost destroyed rather than utterly and completely destroyed. As her mother had once suggested, the younger sister felt things more intensely than anyone else. At the time, very young, the younger sister had seen this as a mark of emotional superiority, but later she saw it for what it was: a serious defect that kept her from living her life. Indeed, as the younger sister reached first her teens and then her twenties, she came to realize that people who felt things as intensely as she were either institutionalized or dead. This realization was at least in part due to her father having belonged to the first category (institutionalized) and her mother to the second (dead by suicide)—two more facts that her older sister, gliding effortlessly and, quite frankly, mercilessly, through life, had also sidestepped. Indeed, while the younger sister was realizing to a more and more horrifying degree how she was inescapably both her mother’s and her father’s child, her older sister had gone on to start a family of her own. It was like her older sister had been part of a different family. The younger sister could never start a family of her own—not because, as everyone claimed, she was irresponsible but because she knew it just brought her one step closer to ending up like her mother and father. It was not that she was irresponsible, but only that she was terrified of ending up mad or dead.